Pretty sure I was still living in NYC three years ago when I first thought about shooting an image like this. Someone way back when, probably in some dank bar near Chinatown, brought to my attention that it was illegal to bring a lion to a movie theatre in Maryland. I immediately thought two things… A) How did people do this so often that the State of Maryland actually had to create a law against it and B) How hilarious would it be to visually create a scene like that in this day an age. With both of these thoughts sparking various google searches, we began to discover numerous other laws of this nature… nearly all of which were so visual in their definition that I felt I had no choice but to figure out a way to make these a reality. Thus, the Blue Laws project was born. Above: Just couldn’t resist… How often do you get to point an assault rifle at an actor on set? Now it should definitely be known that I am not the first to attempt this sort of imagery, as Olivia Locher did so already here. While I love her images for their simplicity, I feel that there was room to create a fantastical type of world in which these crimes were not just being broken, but enforced as well. Our first job was to find a law that we could have a lot of fun with and animals always seem to fit the bill when it comes to having fun on set. 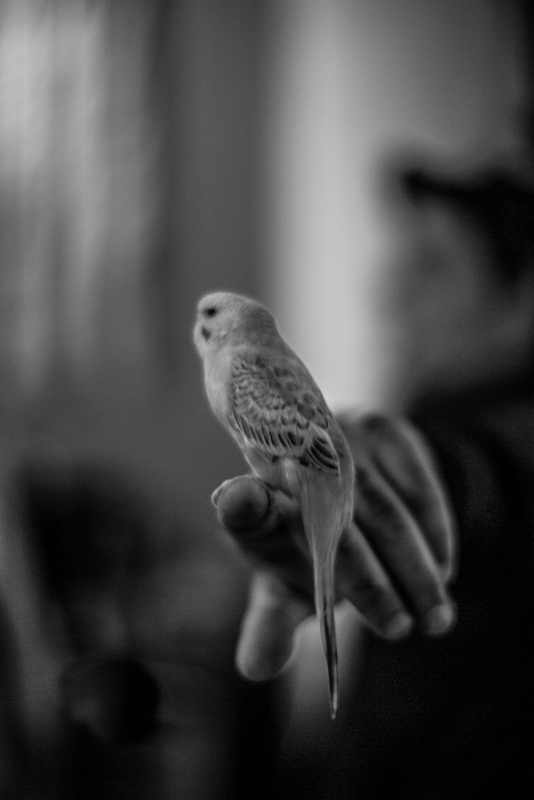 The law we chose to re-create is a statute from Harper Woods, Michigan which states that it is illegal for one to paint a sparrow and then sell it as a parakeet… because apparently that was a rampant crime back in the 1800’s when owning a parakeet was a status symbol. One of our models for the day taking 5 before showtime. Getting good at pretending like I know what I’m doing. Photo by Paul Duna. This project was also going to cause quite a bit of a headache for me as there were going to be far more moving parts that I thought I could handle on my own. I immediately reached out to my digital artist extraordinaire Jason Feiler, whom I knew would have a VERY large role to play in creating the vision I had. We met and discussed what we thought we’d need to pull off the image in the way we wanted. 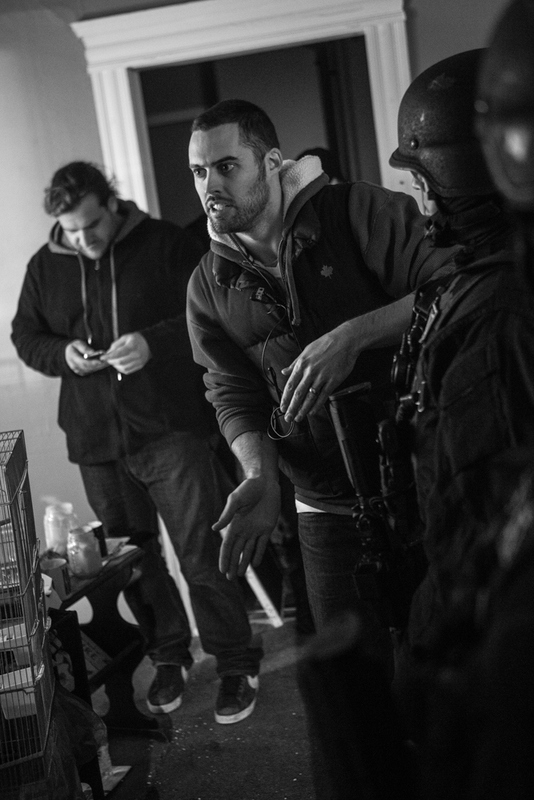 His first thought was “You’re going to need a producer for something like this… and I think I know just the one.” Shortly after bringing Jules into the fold, we soon found ourselves talking with Cleveland SWAT about live weapons on set. We also started scouting locations given to us by Michael Flemming, the Executive Director of the St. Clair Superior Development Corporation who is working to rehab nearly condemned houses across the area. 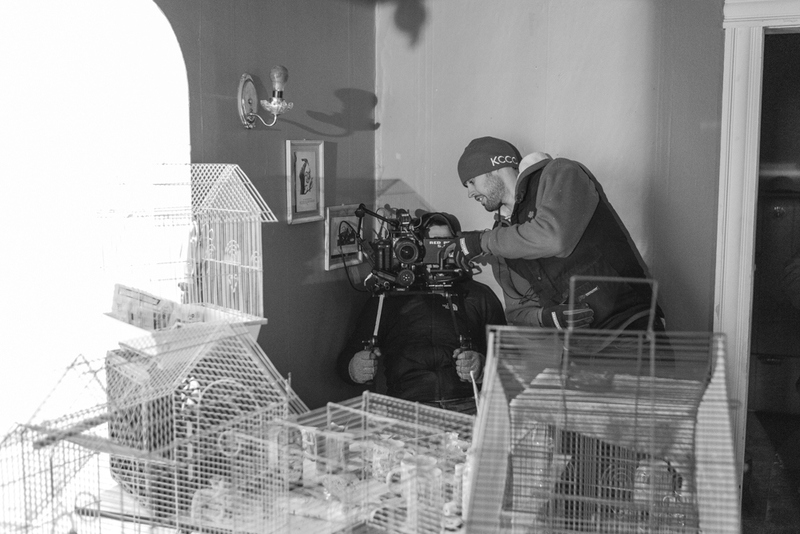 I had my art director Alex Piotrowski building sparrow traps and Julia on the phone with multiple pet stores trying to explain why we need to borrow 30 parakeets for 48 hours… not an easy task. This was quickly turning into quite the production and becoming more and more expensive by the minute. Since we were, and sort of still are, planning to do a crowdfunding campaign to raise funds for the rest of the series (if people dig this first one, that is) in which it includes 5-7 total, I felt comfortable-ish footing the bill for this first one. Above: Jimmy Gall of Purple Films getting comfy with Tyler in Jules’ minivan dolly. Photo by Paul Duna. I’m a big fan of shop local, and it’s kind of a Cleveland mantra at this point. So we went with Dodd Camera for all of the equipment rental needs we could, and Ohio HD for some of the higher-end film equipment that we were looking for. My ace in the hole for this project was Thomas Semple who has been a camera operator and 1st AC on basically every major production that has come to town, from Captain America: The Winter Soldier to Nike commercials. 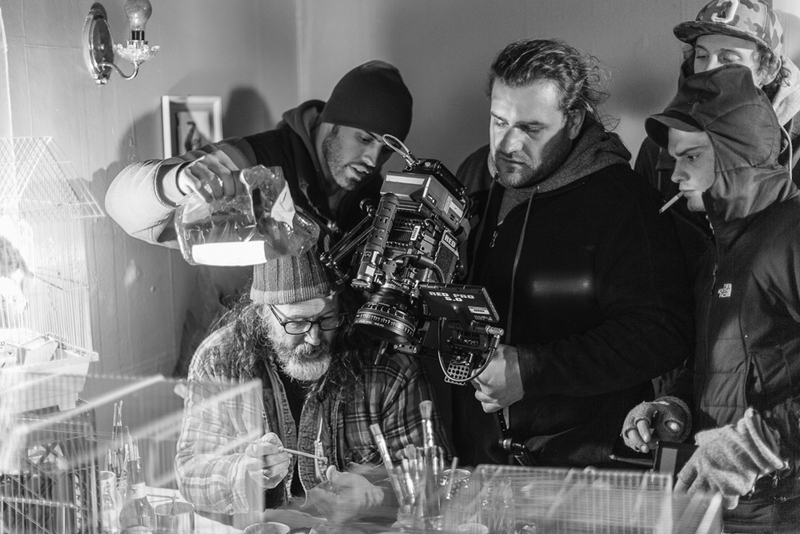 The Red EPIC is a staple in the film industry now, and shooting in 5K raw with some Zeiss CP2 cinema primes would give us not only a lot of latitude but tons of detail to show the amazing set design and art direction that we put together. The camera system choice was also very compact and allowed us to squeeze into some tight spots with relative ease. Thomas Semple and I getting small to plan the takedown shot. Photo by Paul Duna. Getting close to having too many cooks in the kitchen. Photo by Paul Duna. Authenticity is something that has always been very important for me and this production would be no different. We probably could have gone to the nearest costume store and picked up some cheap SWAT team helmets and vests, but since there is so much more to these guys than meets the eye, there would be no substitute for the real thing. It was also brought to my attention that this is something they do relatively often (while off duty, of course) and actually enjoy!! 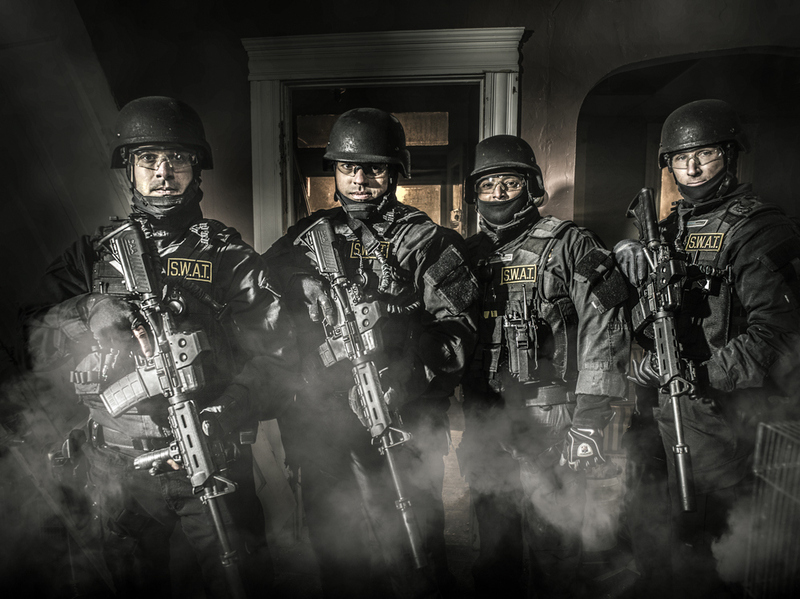 Having the real deal Cleveland SWAT with all of their gear just made the whole shoot so much better. Jules even had to double AND triple check that their weapons were unloaded and clear before coming on set. Directing these guys was a breeze as well; all I had to do was sit back and let them do what they do best!! Above: A pickup shot of our amazing Cleveland SWAT Team. Naturally on our first shoot day it was 48 and raining on and off the whole time, which would clearly complicate everything and make everyone just about as miserable as we could be. However, the show must go on and wet roads are pretty cool to shoot on, so there’s always that. Day one was all about outside and getting the driving shots out of the way so we could concentrate our efforts inside the house on Day 2. Our second day started out great with blue skies and a little nip in the air, but nothing hardened Cleveland filmmakers couldn’t handle. Although this is Cleveland, so it just couldn’t last. Just as the sun began to go down, the first blizzard of the year descended on us and the temperature dropped into the teens. The wind kicked up something fierce… really good news for the Profoto HMI’s and Arri 650’s we had outside on generators. There’s a reason great gear is expensive and worth every penny because we didn’t have one issue with any of our lights the entire time. Above: Dan Gillespie and I doing some final adjustments in 10 degree weather. Photo by Paul Duna. After a few video takes with Sgt. Delgado and his team, it was time for the film crew to take a breather and for me to go to work. 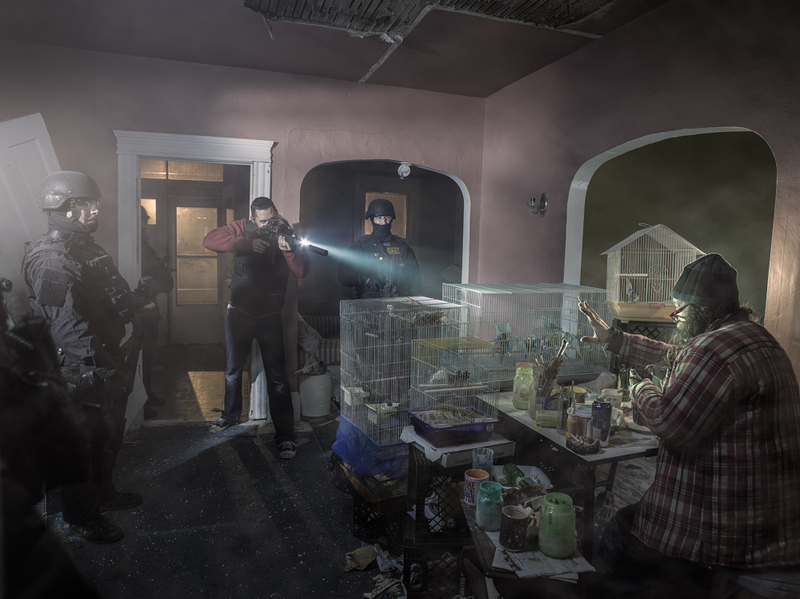 I never thought I’d feel rushed on my own set, but with a crew of 15+ watching, it can put a lot of pressure on even the most professional of shooters… so I was freaking out a little to say the least. We switched out a couple of the hot lights for our trusty Profoto B3 1200 and the Profoto Acute 600, made some slight adjustments to the set, and we were shooting in a matter of minutes. Having pretty much walked through and sketched out the scene to every detail felt like putting together a puzzle for the 100th time. Everything fell into place and we got the shot we needed in about 25 frames. High fives all around guys!!! The final raw image we selected is shown below. To go from that raw capture to the finished piece would be the magic of Jason Feiler and all of the amazing things that he can do with Adobe Photoshop. I did head back to the location after the shoot for some more detail and texture shots that we ended up using on the walls, but that’s not terribly exciting. Being the digital artist behind a lot of my more energetic imagery, Jason has spent more than 60 hours bringing all of the pieces together on this image and I couldn’t have asked for a better result. Below are a few details of the final image and the finished piece itself. Now that the still was taken care of, it was time to get to work on the short film. We brought in D&A to take care of the editing and my Grammy Award winning music producer/golfing buddy Alex Hitchens to put an original score to the piece. I think he pretty much nailed the emotions we were going for. Check out the video below. FOOTNOTE: This shoot actually went down on November 23, 2013 making this by far the longest term personal project I have ever worked on. Some of that delay had to do with a multitude of unforeseen factors, from misplaced audio to sudden illness, but most of which I think had to do with me putting this image and the video on such a high pedestal in my mind that I became too afraid to bring it to the public eye. The thought of this project not being well received put a lot of unnecessary pressure on us to make it absolutely perfect, and the pursuit of that perfection kept it hidden for nearly 2 years. I had some help lately coming to a realization that nothing will ever be perfect and it doesn’t necessarily need to be, sometimes it just needs to be done. This piece was an incredible learning experience for both myself and my crew; not only showing us what we’re capable of when we all work together but also what we sometimes will have to overcome to put ourselves out there and be vulnerable. My trusty producer and buffer of all things unbuffed Julia Toke. The only real reason this looks as cool as it does is due to the digital artistry of Jason Feiler. Sgt. Delgado and the rest of Cleveland SWAT for being so talented and cool about what they do. 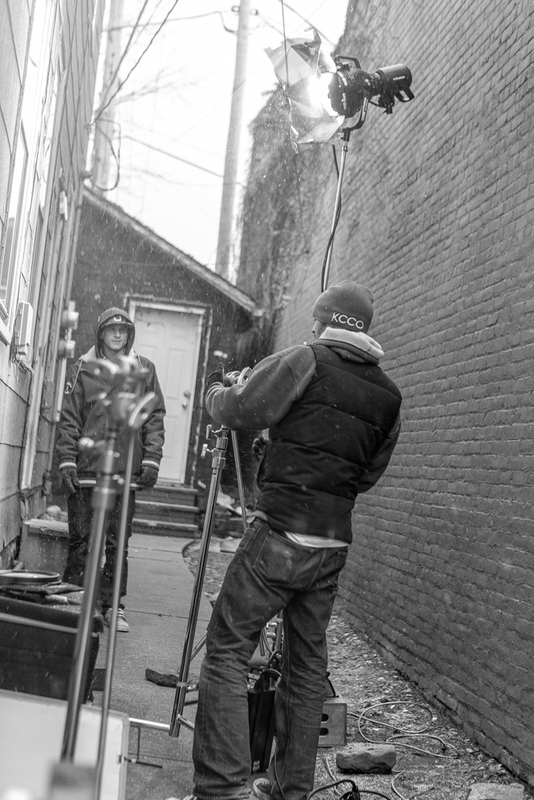 The guys over at Purple Films for braving the cold, wind, and rain to bring this video and vision to life. My swiss army knife of a first AC Thomas Semple without whom this never would have gotten off the ground. To the crews over at Dodd Camera and Ohio HD for trusting the new guy in town with some of their best gear. The set design by Alex Piotrowski was nothing short of spectacular and polished off by Maggie Kleinman. My all-things music go to Grammy winner Alex Hitchens for composing and creating a one of a kind soundtrack. The boys over at D&A films for cutting together the footage and color grade. The teams at Mamiya, Profoto, and ARRI for making such an amazing hardware. Main Light Power Source: One Profoto Pro-B3 1200 AirS Power Pack. Camera: Red Epic 5K Digital Cinema Capture system.